Shoes – Dance shoes or comfortable shoes with soft soles that are secure to the feet, trainers tend to stick to the floor. No flipflops. Clothes – Anything comfortable giving freedom of movement. Dance classes are held in Barry Yacht Club which is a very friendly and welcoming club with panoramic views of the Bristol Channel. 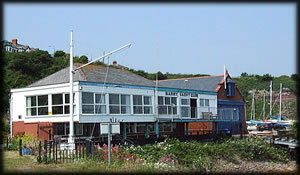 The dance studio itself has a sea view as well as a licensed bar, excellent facilities and car parking. Once on the Causeway to Barry Island, take first left under railway bridge then turn right at the next roundabout onto Plymouth Road. At top of Plymouth Road and next to Clive Place follow the sign to ‘RNLI, ABP Pilot Station’ follow this road round to the right and you will see the sign for Barry Yacht Club.